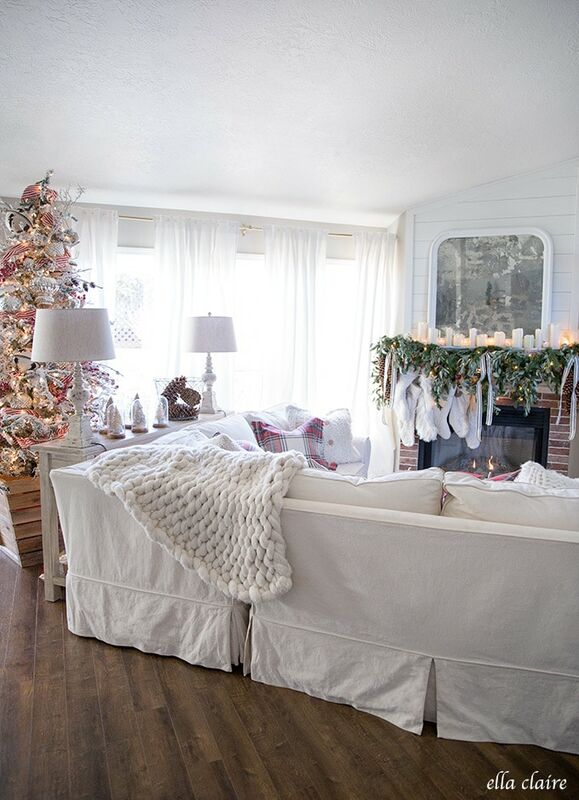 A cozy, nostalgic Christmas family room with flocked tree and little vintage inspired holiday details. I got my family room all decorated for Christmas! 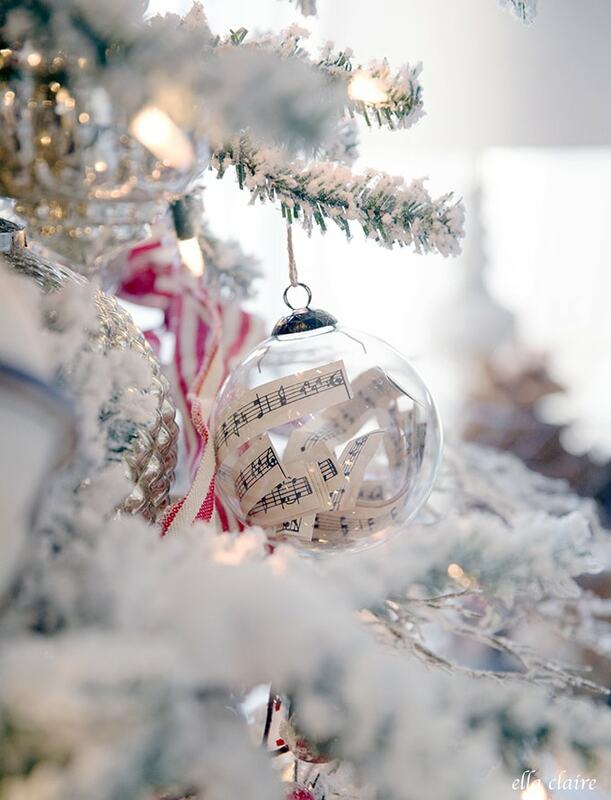 I had decided this year to go with neutrals for my Christmas decor… and then this happened. Pops of red everywhere! It seems I just can’t resist during the Christmas season to bring in that happy, cozy red. 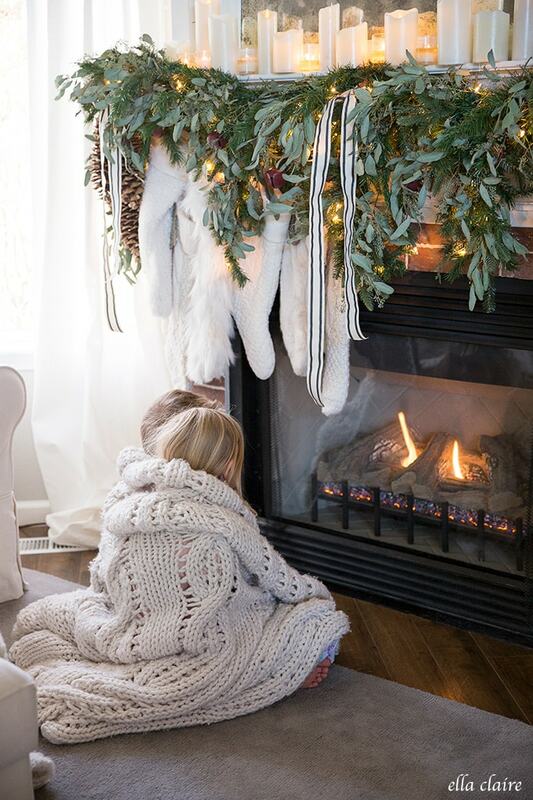 Christmas is such a magical time in our home with our 4 littles. They fully inspected the fireplace tonight to make sure there was enough room for santa to come. It was decided that it will take a little magic for him to make it in this way, but that he could handle it. This year, I have felt a deep longing for home. We have had some significant changes in our family in the past couple year and I think it has caught up to me a little. I can’t describe it very well, but I am just feeling very nostalgic and I decided to add sweet vintage touches here and there. They always make me happy. 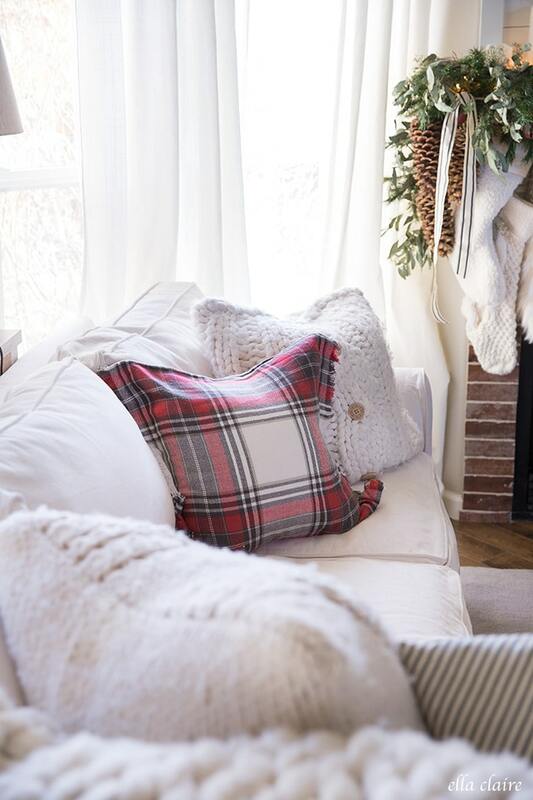 I added these cute red plaid pillows this year (find them HERE) and they are so soft and cozy. Perfect for our family space. I love all of the creams mixed with the pops of red. My littles love to snuggle by the fire. 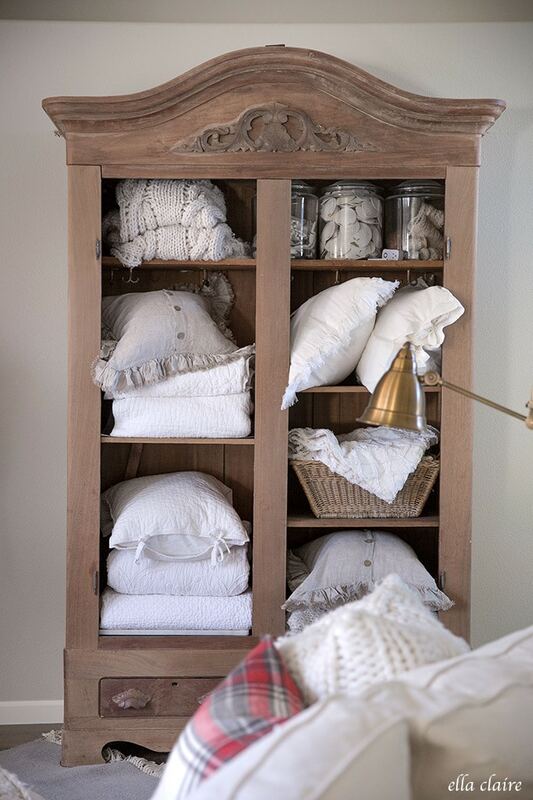 I always have a big basket readily available with extra blankets and throws for anyone who might need one during the cold Idaho winter months. 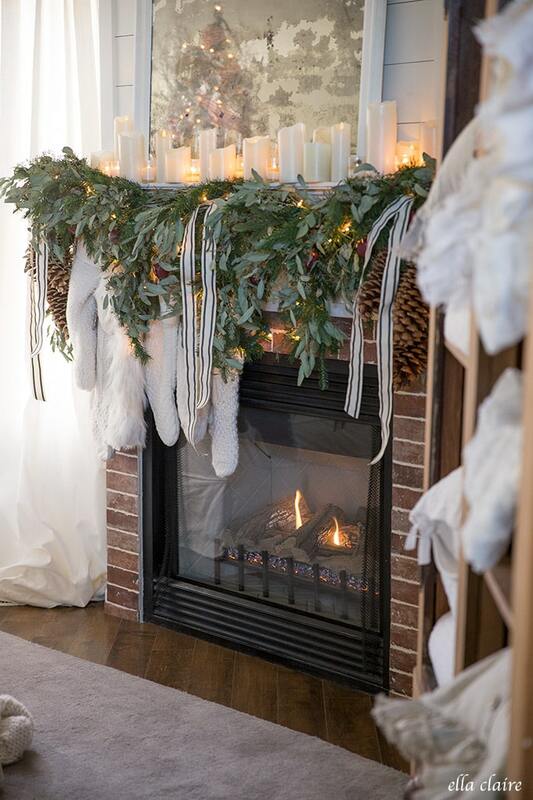 For my fireplace this year, I used the same garland from the past couple of years, but I dressed it up with fresh eucalyptus from my flower arrangement last week. It was dried out, but still very pretty. If you follow me on Instagram, then you have seen my tree already- except I added a few things. I added my distressed rusty bells (from my Halloween tree) and some adorable music sheet scroll ornaments. 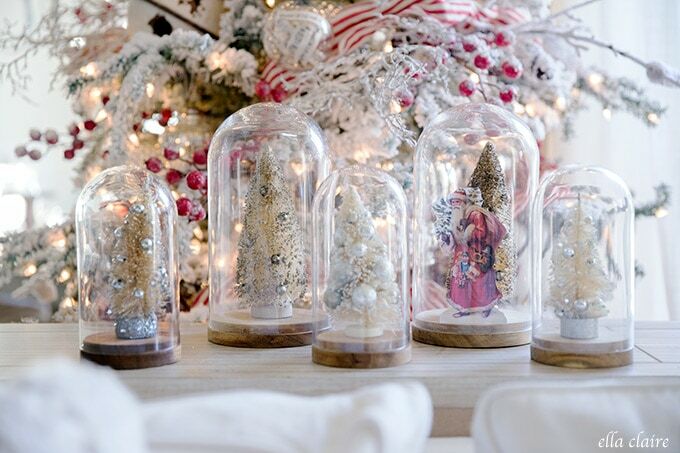 I wanted to evoke the feeling of a light and happy vintage Christmas. 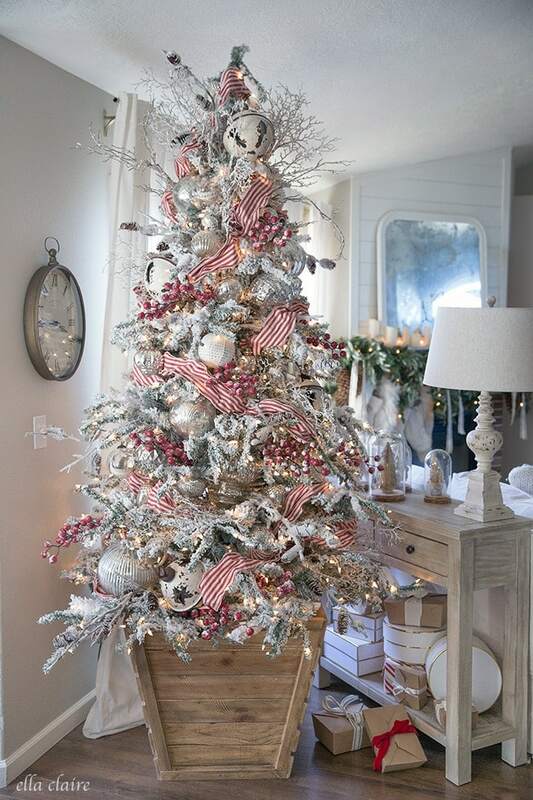 All sources are listed HERE, including my very favorite flocked Christmas tree! It is so pretty in person and has SO many lights which I love! I built this box for my tree to keep it up and away from the baby- you can see the tutorial HERE. 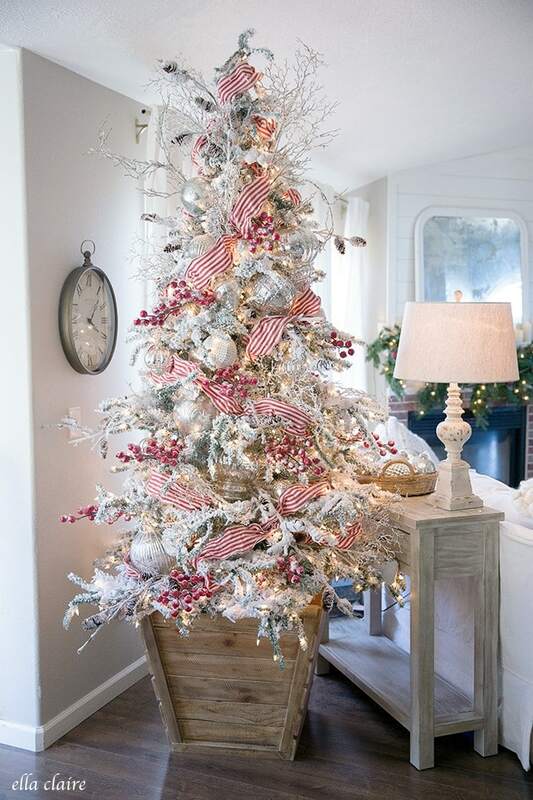 You can also see how to flock a Christmas tree HERE, my ribbon tips HERE, and how to decorate a Christmas tree HERE. On my sofa table, I wanted to add a nativity, but haven’t had any luck yet finding one. 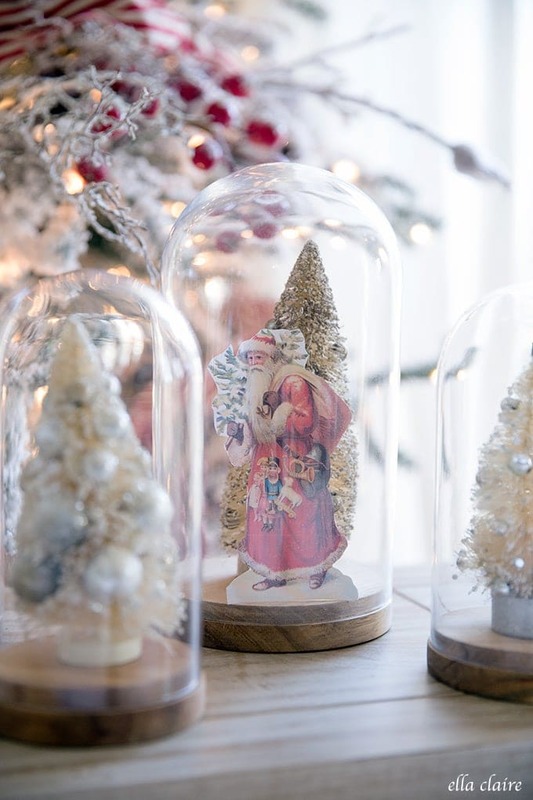 I threw this little cloche tree scene together last minute with a sweet little vintage santa. I can offer that as a printable if anyone is interested. We have already begun driving around looking at the Christmas lights and the kids are enjoying our decorations being out. I love this season so much. 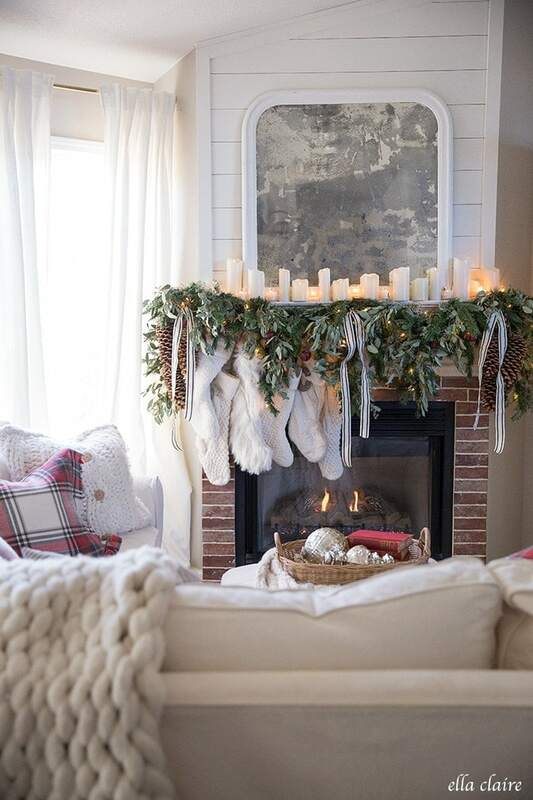 Here are 15 more Christmas family rooms for you! I know you will love all of the inspiration! 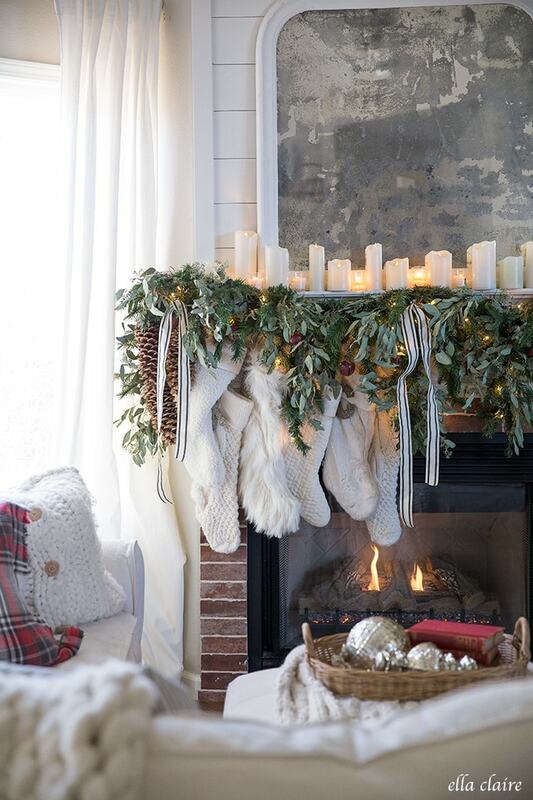 Do you just use one garland or more than one? Thank you!! I love your Christmas decor. 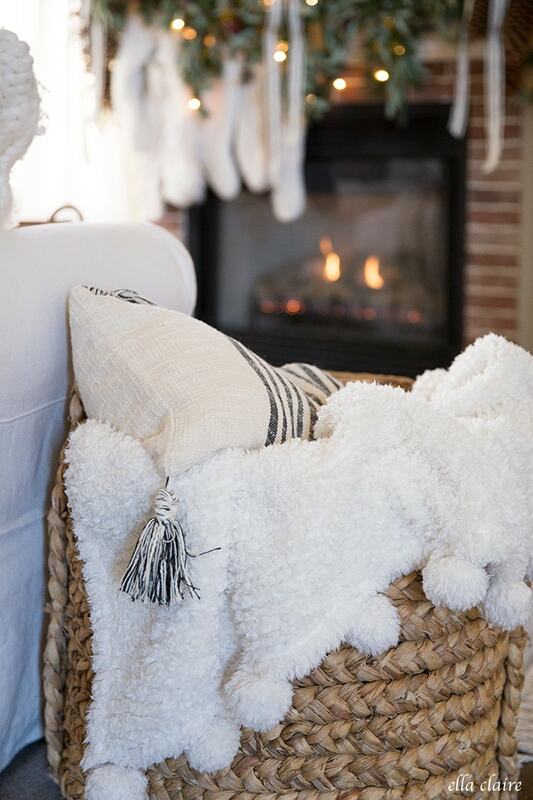 So pretty with the right amount of vintage and cozy little touches. Your tree has me wishing I had a different tree too! It’s so cute!